Baden-Württemberg (/ˈbɑːdən vɜːrtəmˌbɜːrɡ/; [ˌbaːdn̩ˈvʏʁtm̩bɛʁk]) is a state in Germany located in the southwest, east of the Upper Rhine. It is Germany’s third largest state in terms of size and population, with an area of 35,751 square kilometres (13,804 sq mi) and 10.8 million inhabitants. The state capital and largest city is Stuttgart. The sobriquet Ländle ("small land" or "dear land" in the local dialect) is sometimes used as a synonym for Baden-Württemberg. Today's Baden-Württemberg is formed from the historical territories of Baden, Prussian Hohenzollern, and the Württemberg part of Swabia. In 100 AD, The Roman Empire invaded and occupied Württemberg, constructing a limes (fortified boundary zone) along its northern borders. Over the course of the third century AD, the Alamanni forced the Romans to retreat beyond the Rhine and Danube rivers. In 496 AD the Alemanni themselves succumbed to a Frankish invasion led by Clovis I. After World War II, Allied forces established three federal states in the territory of modern-day Baden-Württemberg: Württemberg-Hohenzollern, Baden, and Württemberg-Baden. Baden and Württemberg-Baden were occupied by France and the United States respectively. In 1949, each state became a founding member of the Federal Republic of Germany, with Article 118 of the German constitution providing an accession procedure. On 16 December 1951, Württemberg-Baden, Württemberg-Hohenzollern and Baden voted in favor of a joint merger via referendum. Baden-Württemberg officially became a state in Germany on 25 April 1952. Baden-Württemberg shares borders with France (region of Grand Est), Switzerland (cantons of Basel-Landschaft, Basel-Stadt, Aargau, Zürich, Schaffhausen and Thurgau), and the German states of Rhineland Palatinate, Hessen, and Bavaria. 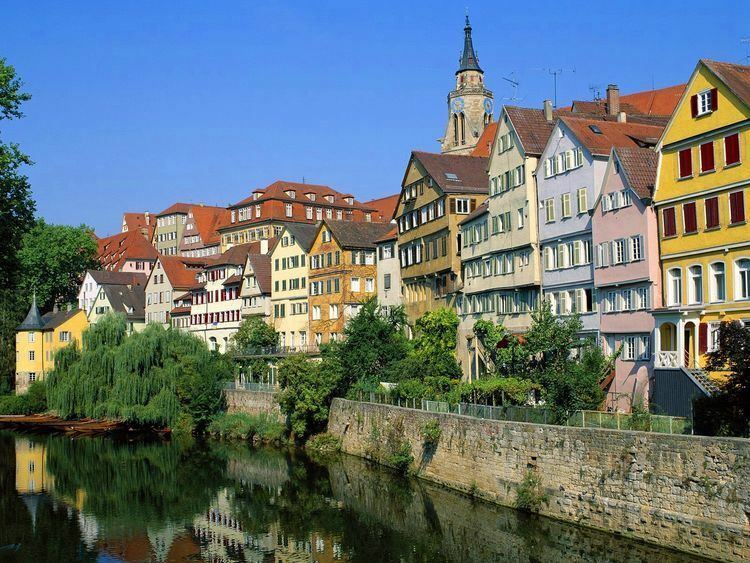 Most of the major cities of Baden-Württemberg straddle the banks of the Neckar River, which runs downstream (from southwest to the center, then northwest) through the state past Tübingen, Stuttgart, Heilbronn, Heidelberg, and Mannheim. The Rhine (German: Rhein) forms the western border as well as large portions of the southern border. The Black Forest (Schwarzwald), the main mountain range of the state, rises east of the Upper Rhine valley. The high plateau of the Swabian Alb, between the Neckar, the Black Forest, and the Danube, is an important European watershed. Baden-Württemberg shares Lake Constance (Bodensee, also known regionally as the Swabian Sea) with Switzerland (the border is the middle of the lake) and it shares the foothills of the Alps (known as the Allgäu) with Bavaria and the Austrian Vorarlberg (but Baden-Württemberg does not border Austria over land). The Danube (Donau) river has its source in Baden-Württemberg near the town of Donaueschingen, in a place called Furtwangen in the Black Forest. Täfelberg is a mountain located in the Northern Black Forest and is 565.2 metres above sea level. Baden-Württemberg is divided into thirty-five districts (Landkreise) and nine independent cities (Stadtkreise), both grouped into the four Administrative Districts (Regierungsbezirke) of Freiburg, Karlsruhe, Stuttgart, and Tübingen. The state parliament of Baden-Württemberg is the Landtag (Eng. state assembly). The politics of Baden-Württemberg have traditionally been dominated by the conservative Christian Democratic Union of Germany (CDU), who until 2011 had led all but one government since the establishment of the state in 1952. In the Landtag elections held on 27 March 2011 voters replaced the Christian Democrats and centre-right Free Democrats coalition by a Greens-led alliance with the Social Democrats which secured a four-seat majority in the state parliament. From 1992 to 2001, the Republicans party held seats in the Landtag. The Baden-Württemberg General Auditing Office acts as an independent body to monitor the correct use of public funds by public offices. Although Baden-Württemberg has relatively few natural resources compared to other regions of Germany, the state is among the most prosperous and wealthiest regions in Europe with a generally low unemployment rate historically. A number of well-known enterprises are headquartered in the state, for example Daimler AG, Porsche, Robert Bosch GmbH (automobile industry), Carl Zeiss AG (optics), and SAP SE (largest software enterprise in Europe) and Heidelberger Druckmaschinen (precision mechanical engineering). In spite of this, Baden-Württemberg's economy is dominated by small and medium-sized enterprises. Although poor in workable natural resources (formerly lead, zinc, iron, silver, copper, and salts) and still rural in many areas, the region is heavily industrialised. In 2003, there were almost 8,800 manufacturing enterprises with more than 20 employees, but only 384 with more than 500. The latter category accounts for 43% of the 1.2 million persons employed in industry. The Mittelstand or mid-sized company is the backbone of the Baden-Württemberg economy. Medium-sized businesses and a tradition of branching out into different industrial sectors have ensured specialization over a wide range. A fifth of the "old" Federal Republic's industrial gross value added is generated by Baden-Württemberg. Turnover for manufacturing in 2003 exceeded 240,000 million, 43% of which came from exports. The region depends to some extent on global economic developments, though the great adaptability of the region's economy has generally helped it through crises. Half of the employees in the manufacturing industry are in mechanical and electrical engineering and automobile construction. This is also where the largest enterprises are to be found. The importance of the precision mechanics industry also extends beyond the region's borders, as does that of the optical, clock making, toy, metallurgy and electronics industries. The textile industry, which formerly dominated much of the region, has now all but disappeared from Baden-Württemberg. Research and development (R&D) is funded jointly by the State and industry. In 2001, more than a fifth of the 100,000 or so persons working in R&D in Germany were located in Baden-Württemberg, most of them in the Stuttgart area. Baden-Württemberg is also one of the Four Motors for Europe. A study performed in 2007 by the PR campaign "Initiative for New Social Market Economy" (German: Initiative Neue Soziale Marktwirtschaft (INSM)) and the trade newspaper "Wirtschaftswoche" awarded Baden-Württemberg for being the "economically most successful and most dynamic state" among the 16 states. Baden-Württemberg is a popular holiday destination. Main sights include the capital and biggest city, Stuttgart, modern and historic at the same time, with its urban architecture and atmosphere (and famously, its inner city parks and historic Wilhelma zoo), its castles (such as Castle Solitude), its (car and art) museums as well as a rich cultural programme (theatre, opera) and mineral spring baths in Stuttgart-Bad Cannstatt (also the site of a Roman Castra); it is the only major city in Germany with vineyards in an urban territory. The residential (court) towns of Ludwigsburg and Karlsruhe, the spas and casino of luxurious Baden-Baden, the medieval architecture of Ulm (Ulm Münster is the tallest church in the world), the vibrant, young, but traditional university towns of Heidelberg and Tübingen with their old castles looking out above the river Neckar, are popular smaller towns. Sites of former monasteries such as the ones on Reichenau Island and at Maulbronn (both World Heritage Sites) as well as Bebenhausen Abbey are to be found. Baden-Württemberg also boasts rich old Free Imperial Cities such as Biberach, Esslingen am Neckar, Heilbronn, Ravensburg, Reutlingen, and Schwäbisch Hall, as well as the southernmost and sunniest city of Germany, Freiburg, close to Alsace and Switzerland, being an ideal base for exploring the heights of the nearby Black Forest (e.g., for skiing in winter or for hiking in summer) with its traditional villages and the surrounding wine country of the Rhine Valley of South Baden. The countryside of the lush Upper Neckar valley (where Rottweil is famous for its carnival (Fastnacht)) and the pristine Danube valley Swabian Alb (with Hohenzollern Castle and Sigmaringen Castle), as well as the largely pristine Swabian Forest, the Upper Rhine Valley, and Lake Constance (German: Bodensee), where all kinds of water sports are popular, with the former Imperial, today border town of Konstanz (where the Council of Constance took place), the Neolithic and Bronze Age village at Unteruhldingen, the flower island of Mainau, and the hometown of the Zeppelin, Friedrichshafen a.o., are especially popular for outdoor activities in the summer months. In spring and autumn (April/May and September/October), beer festivals (fun fairs) take place at the Cannstatter Wasen in Stuttgart. The Cannstatter Volksfest, in the autumn, is the second largest such festival in the world after the Munich Oktoberfest. In late November and early December Christmas markets are a tourist magnet in all major towns, with the largest being in Stuttgart during the three weeks prior to Christmas. The Bertha Benz Memorial Route is a 194 km signposted scenic route from Mannheim via Heidelberg and Wiesloch to Pforzheim and back, which follows the route of the world's first long-distance journey by automobile which Bertha Benz undertook in August 1888. Baden-Württemberg is home to some of the oldest, most renowned, and prestigious universities in Germany, such as the universities of Heidelberg (founded in 1386, the oldest university within the territory of modern Germany), Freiburg (founded in 1457), and Tübingen (founded in 1477). It also contains three of the eleven German 'excellence universities' (Heidelberg, Tübingen, and Konstanz and formerly, Freiburg and Karlsruhe). Other university towns are Mannheim and Ulm. Furthermore, two universities are located in the state capital Stuttgart, the University of Hohenheim, and the University of Stuttgart. Ludwigsburg is home to the renowned national film school Filmakademie Baden-Württemberg (Film Academy Baden-Wuerttemberg). The private International University in Germany was situated in Bruchsal, but closed in 2009. There is still another private university, located in Friedrichshafen, Zeppelin University. Furthermore, there are more than a dozen Fachhochschulen, i.e., universities of applied sciences, as well as Pädagogische Hochschulen, i.e., teacher training colleges, and other institutions of tertiary education in Baden-Württemberg. (a.o. in Aalen, Biberach an der Riss, Esslingen, Karlsruhe, Ludwigsburg, Nürtingen, Pforzheim, Ravensburg-Weingarten, Reutlingen, several in Stuttgart, Schwäbisch Hall). Pforzheim University is one of the oldest Fachhochschulen in Germany which is renowned and highly ranked for its Engineering and MBA programs. The state has the highest density of academic institutions of any territorial state (i.e., excluding Berlin and Hamburg) in Germany. Two dialect groups of German are spoken in Baden-Württemberg in various variants: Alemannic and Franconian dialects. In central and southern Württemberg, the Alemannic dialect of Swabian is spoken (slightly differing even within the area, e.g., between Upper Swabia, the Swabian Alb, and the central Neckar Valley of the Stuttgart region). In South Baden, the local dialects are Low Alemannic and High Alemannic (i.e., variants of what is also Swiss German). In the northern part of Baden, i.e., the former Kurpfalz (Electorate of the Palatinate) with the former capitals of Heidelberg and Mannheim, the idiom is Rhine Franconian (i.e., Palatinate German), while in the Northeast East Franconian is spoken. The same or similar Alemannic dialects are also spoken in the neighbouring regions, especially in Bavarian Swabia, Alsace (Alsatian), German-speaking Switzerland (Swiss German), and the Austrian Vorarlberg, while the other Franconian dialects range from the Netherlands over the Rhineland, Lorraine, and Hesse up to northern Bavaria Franconia. A variant of the Alemannic German of Baden developed into the Colonia Tovar dialect, spoken by descendants of immigrants from Baden who went to Venezuela in 1843. The population of Baden-Württemberg is 10,486,660 (2014), of which 5,354,105 are female and 5,132,555 are male. In 2006, the birth rate of 8.61 per 1000 was almost equal to the death rate of 8.60 per 1000. 14.87 percent of the population was under the age of 15, whereas the proportion of people aged 65 and older was at 18.99 per cent (2008). The dependency ratio - the ratio of people aged under 15 and over 64 in comparison to the working age population (aged 15–64) - was 512 per 1000 (2008). Baden-Württemberg has long been a preferred destination of immigrants. As of 2013, almost 28% of its population had a migration background as defined by the Federal Statistical Office of Germany; this number clearly surpassed the German average of 21% and was higher than in any other German state with the exception of the city states of Hamburg and Bremen. As of 2014, 9,355,239 of the population held German citizenship, whereas 1,131,421 were foreign nationals. Northern and most of central Württemberg has been traditionally Protestant (particularly Lutheran) since the Reformation in 1534 (with its centre at the famous Tübinger Stift). The former Electorate of the Palatinate (Northwestern Baden) with its capital Heidelberg was shaped by Calvinism before being integrated into Baden. Upper Swabia, and the Upper Neckar Valley up to the bishop seat of Rottenburg, and Southern Baden (the Catholic archbishop has its seat in Freiburg) have traditionally been bastions of Roman Catholicism.